This year’s competitors (from the left), Ian Elsey, Gary Cox, Dave Troop, Simon Blaydes, Phil Middleton, Andy Wright, Dave Wass, Jim Smith. Even though the south wind howled and the rain lashed down; eight excitable men still turned out in high spirits, some had even come home from the pub early Saturday night ready for the big day! The usual banter ensued as I (Simon Blaydes) commented on the horizontal rain, Phil Middleton kindly reassured me that I didn’t need to worry about the rain as drips don’t get wet! Thanks Phil. The pegs were drawn at random, Dave Troop unbelievably pulling the magical peg 12 ‘’Ricks Peg’’ for the second year running. By 9.50am time was called and the sky was a blur of hi visibility floats, feeders, pole rigs and catapulted sweetcorn. The match was fairly steady with the weather making presentation challenging! 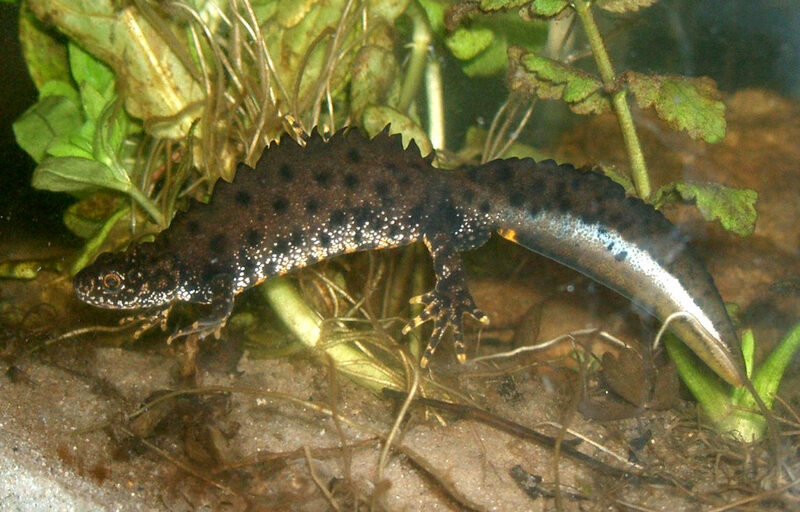 The lads in the sheltered corners got their heads down and were keeping a steady stream of fish coming. Dave Troop called ‘’time’’ at 1.00pm at that was the end of our third Rick Paton Memorial Match held on 29.07.18. Interestingly, the match was won last year by Phil Middleton from the same peg 2! £40.00 was raised on the day for our chosen charity, The Brain Tumour Charity. Especial thanks to Dawn Peel for providing the snack goody bag of treats that kept us all going nicely throughout the match. Also Dave Stainton, John Dennis and Keith Brazier for helping prepare the grounds and lake for the charity event. 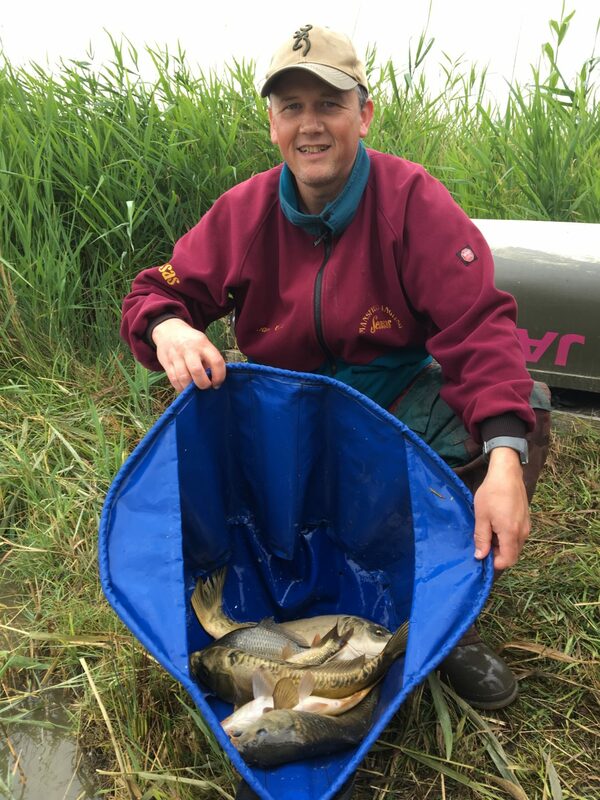 The 2018 winner, Gary Cox with his catch. 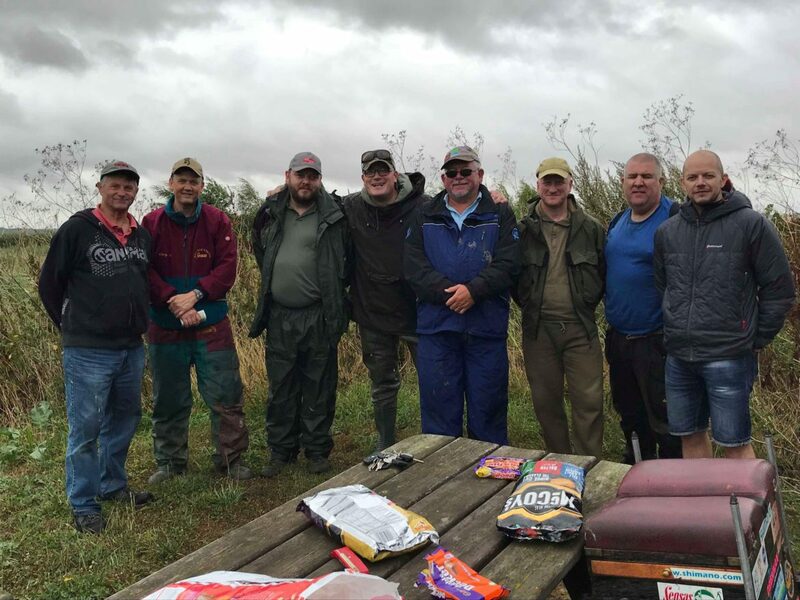 Eight enthusiastic fishermen turned out to commemorate the annual Rick Paton Memorial Charity Match and help raise funds for The Brain Tumour Charity. All of the anglers prepared weeks in advance of the competition, with many using new tackle that was purchased for the special day. Dave Troop (Garage Workshop Foreman and defending champion) had been heard sharpening his hooks on the Garage angle grinder. Gary Cox (Insurance Surveyor) had nearly worn out the grass doing circuits of the lake, locating where the carp were, and his fishing rigs had been critically balanced and custom built to perfection. Oscar (the resident monster carp) was in an especially bad mood as he doesn’t like match day and confirmed his threat to break tackle at all opportunities during a pre-match interview. Dawn Peel (PA to Steve Gelder) blessed us with luxury as per usual serving hot tea and bacon butties as the sun tried to burn through a cloudy Sturton by Stow. The 8.30am draw was exciting with plenty of banter; Dave Troop drawing the best peg (Rick’s peg) to a resounding roar and a barrage of insults and claims of match fixing from Group members! The Match started well with bent rods and splashes being heard all around the lake. 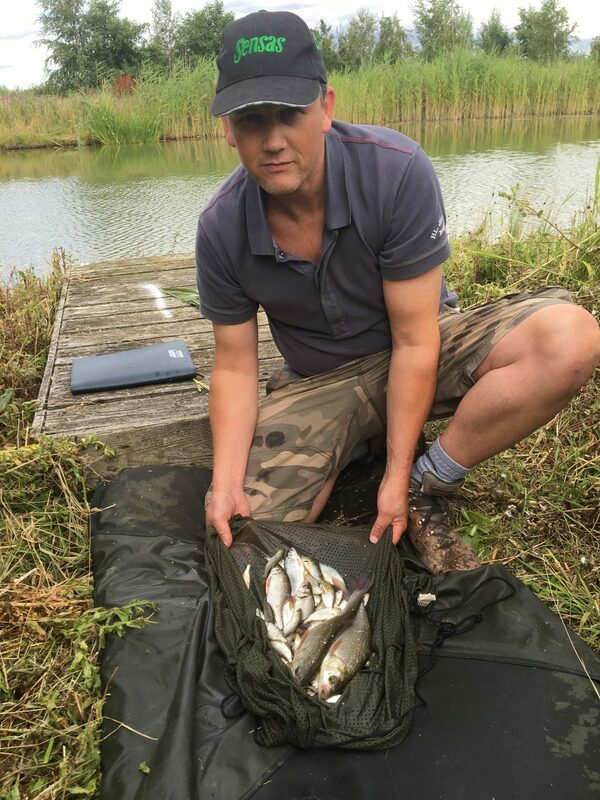 The 2016 match champion Dave Troop had the landing net out 5 times in the first 20minutes – the “Gelder Group Bagging Machine” showing his deadly consistency yet again. Gary remaining patient setting his stall out for Oscar (a brave man for sure), whilst keeping a steady stream of silver fish coming to the net. Splashes could be heard coming from Jason and son Jack Tindall’s peg all day showing that their preparations and match plan was working well. Andy “The Carp” Carpenter (Site Manager) turned up fashionably late with a few heads dropping as last year’s third place champion walked to his peg like a boss. Andy soon made up for lost time, locating the Ide from the off, quickly surpassing some anglers catches (the one on peg 8) after only a few casts! Meanwhile Mr Middleton (Senior Surveyor), aka Phil ‘’THE POWER’’, or just ‘’THE POWER’’, was quietly beavering away with a nice rhythm, putting the net out regularly and building a nice weight, a few one way tickets were hooked but not landed… Perhaps it was that pesky Oscar up to his old tricks again? The effervescent Jim Smith, ever solid with his support for the Group, drawing the magic number peg 3. Jim kept the fish coming with various tactics and bait selection. Simon Blaydes (Design Coordinator) was off to a flyer on peg 8, but failed to finish how he started, peaking too soon. Mr and Mrs Paton gave us all a welcome visit , gifting a bottle of Champagne for the smallest weight of fish on the day. The message on the bottle being ‘’Better Luck next time’’. This was very much appreciated. Dave Troop inspecting his catch. The Gelder Rod and all round dab hand galvanising his reputation with yet another placing on the podium. A 4lb.06.5 oz mixed bag of tench, carp and silver fish. Gary Cox with his impressive catch. The Surveyor from the North West being no stranger to the podium also; pulling off a result from one of the lakes most difficult pegs. He made a patient match plan to catch Oscar and was rewarded with a younger brother of the Lake Big Guy at just over 4lb in weight. Coupled with a respectful back up weight of Silver fish 6lb 13.5oz was enough to secure a very well deserved second place. The 2017 Rick Paton Memorial Fishing Competition Champion, Phil Middleton. 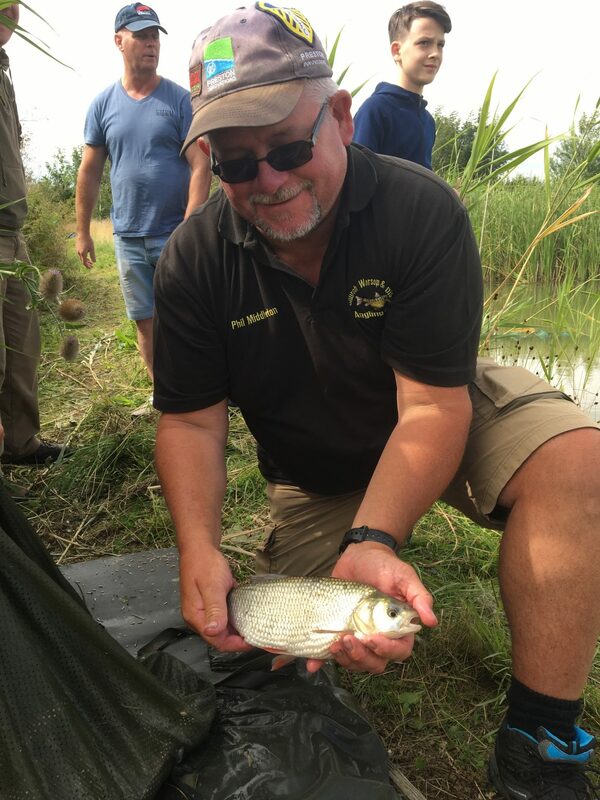 One of the original Barbarians from Barlborough, Phil literally gave us his master class in the art of angling, amassing a very respectful 7lb 4.5oz bag of all silver fish, which is probably one of the hardest earned match weights ever recorded from our lake. Phil fished skilfully keeping the fish coming from start to finish. Phil ‘’The Power’’ for sure! 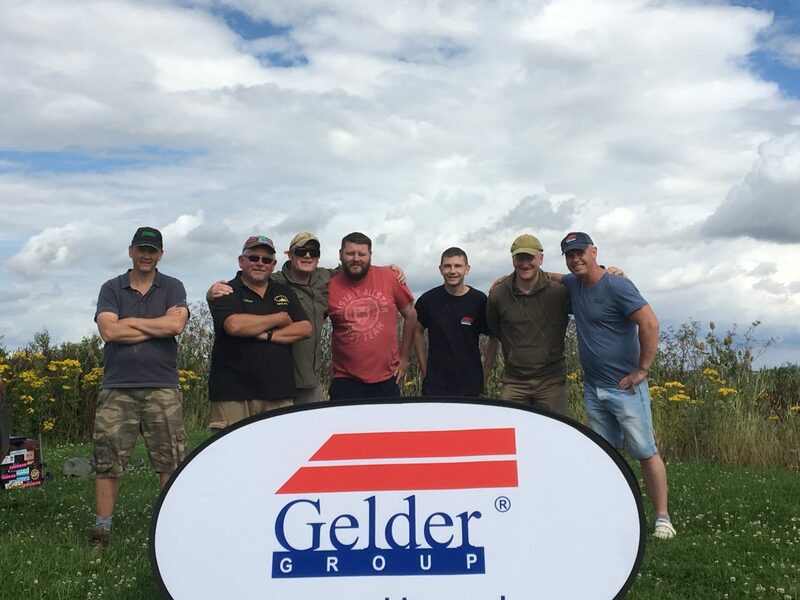 Well done to all those who took part and supported the memorial match with £47.00 raised on the day which was match generously by Gelder Group. 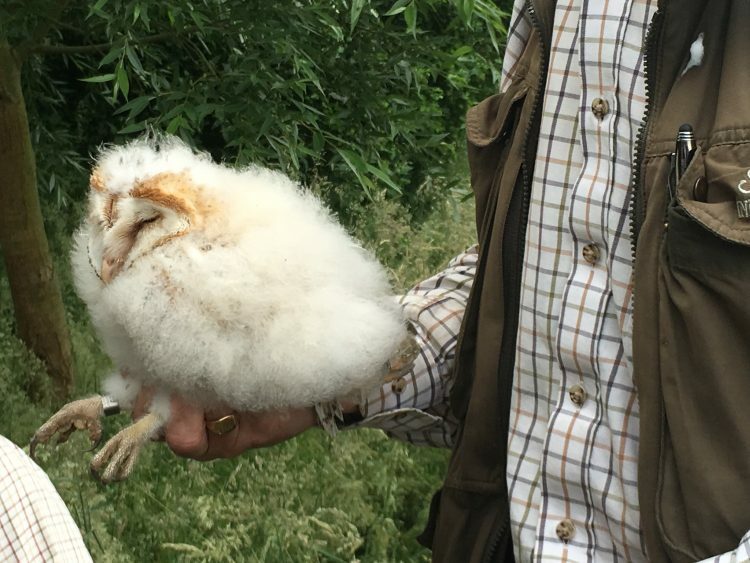 We have once again been successful in creating the right environment for the barn owl and kestrel population to thrive in our environmental park. This year we have recorded two barn owlets and six baby kestrels. All of the birds have now been ringed by licensed bird ringer, Steve Wain. Simon Blaydes with a Ghost Carp he caught on the day. The misty start to the morning did nothing to dampen the spirits of the 13 fishers who entered the ‘What a Whopper! Charity fishing competition. 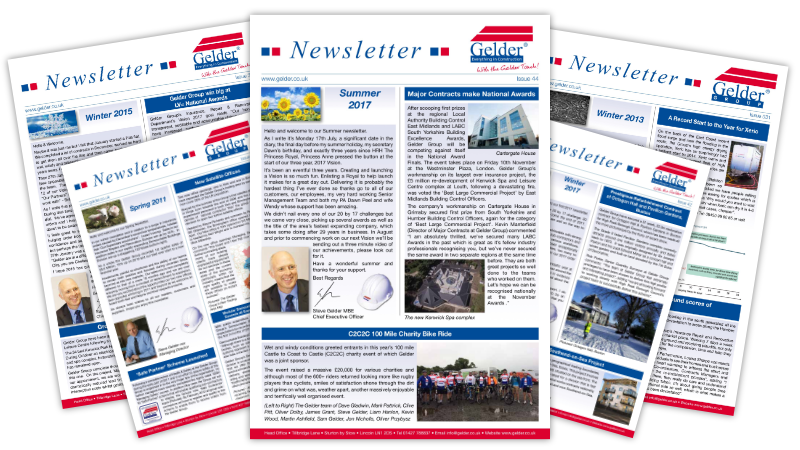 The event was held at the Gelder Group’s Head Office lake on the 27th September and was in aid of The Brain Tumour Charity. 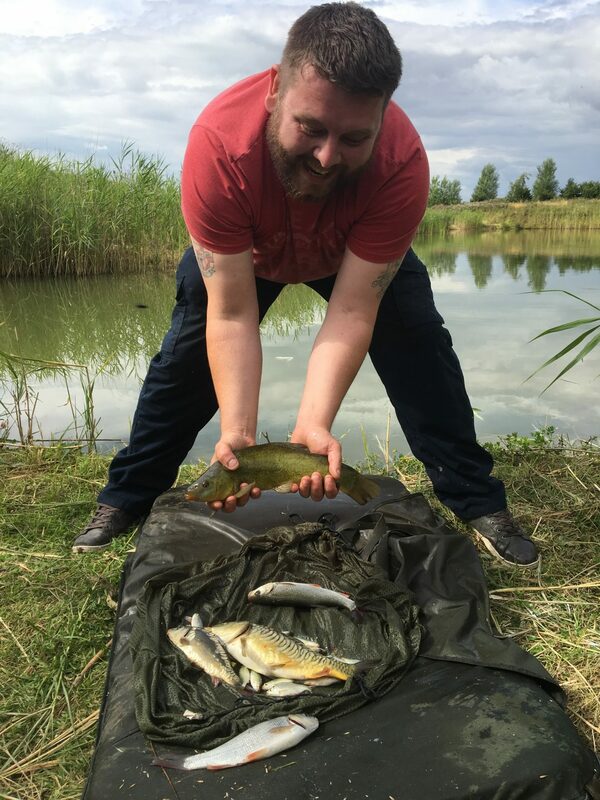 The one acre lake is stocked with a variety of fish including roach, rudd, ade, mirror carp and ghost carp. The largest haul on the day was caught by Simon Blaydes with a total catch of 9lb 14oz. I was of course thrilled to win on the day, but the real winner is the Charity we were raising money for; The Brain Tumour Charity. Simon Blaydes with the first frame of honey. I couldn’t believe how much each frame weighed, 2lb a frame. 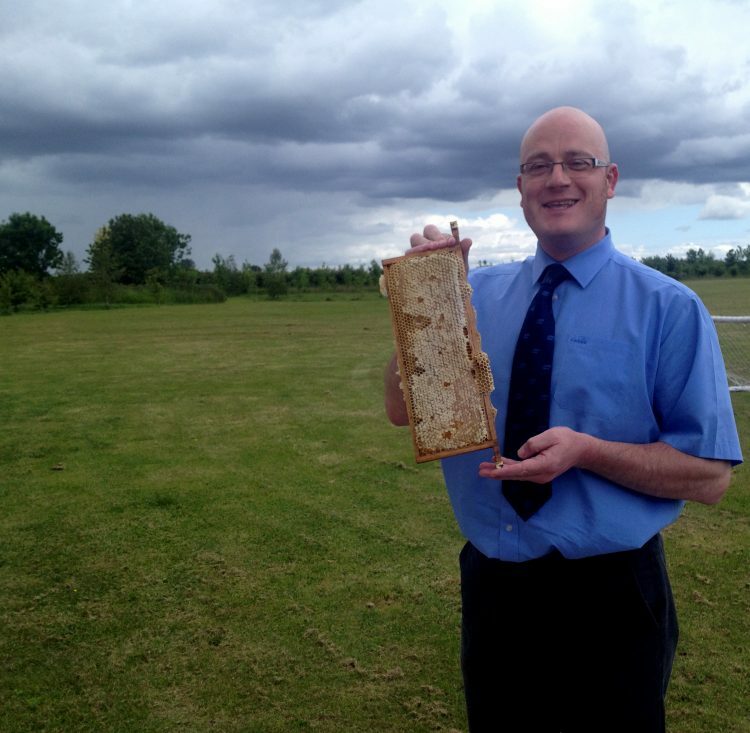 Jason (Bee Keeper from Lincolnshire Beekeepers Association) let me try the honey; needless to say, without question it was the best Honey I have ever tasted. More details of when the jars will be ready will follow. If you cannot wait and want to place an early order, please contact us.